Stone Laboratory: Stone Lab Backpacks! Greetings bloggers (and whomever else is out there in the Blogosphere)! 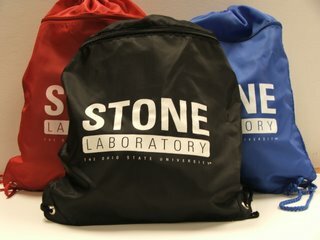 I know most of the bloggers have heard by now, but the Stone Lab Backpacks are officially in and ready for the taking! As a reward for all those hard-working bloggers, these drawstring backpacks are free to those who spent the summer documenting their course work at Stone Lab.
. If you have any questions, contact Nancy at cruickshank.3@osu.edu. Hope the beginning of the school year has found everyone doing well, happy blogging!